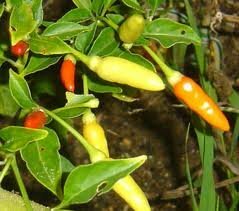 Capsicum frutescens. Plant produces good yields of 2" long by �" wide hot peppers. Peppers turn from green to red when mature. Plant has green stems, dark green leaves, and white flowers. A variety from India.